It’s official. Mauritania’s deputy chief of staff General Hanena Ould Sidi has been officially appointed to lead the combined five-nation “G5 Sahel” force. General Ould Sidi, a graduate of a Moroccan military school, has been appointed to replace General Didier Dacko who is G5 Sahel Joint Force Commander since 2017. General Didier Dacko has been resourceful in negotiations for the operationalization of the regional force. He made strong appeals for more predictable financial support to the regional force tackling terrorist threats in the region. However, a spate of attacks in Mali and neighboring Niger that left more than two dozen people dead since the end of June, including a suicide bombing at the G5 headquarters, led to Dacko’s replacement. 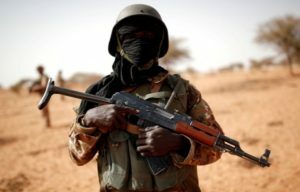 The al Qaeda-linked Support Group for Islam and Muslims, the main jihadist alliance in Africa’s Sahel region, claimed the attack against the G5 headquarters. Set up by Burkina Faso, Chad, Mali, Mauritania, Niger, all bordering on the vast Sahel region, the Force aims to strengthen the fight against threats to peace and security and bolster development. The G5 to have a total of 5,000 troops is facing funding problems and lack of equipment. Posted by Emmanuel Agbenonwossi on July 19, 2018. Filed under News. You can follow any responses to this entry through the RSS 2.0. Both comments and pings are currently closed.